September 5, 2016 – This week, our time machine turns team bus, as we head back not so far into history, to the late ’80s and early ’90s, when your humble host was on the football field — at least at pregame and halftime — for the Cresskill High School marching band, and as a member of Rutgers University’s Marching Scarlet Knights: The Pride of New Jersey. Rutgers won the very first football game in 1869, but as you know from my chat with John J. Miller, author of The Big Scrum: How Teddy Roosevelt Saved Football — that game much more closely resembled rugby, with no quarterback or receivers, so therefore no passing. How did we get from that first game to the kickoff of the 2016 regular season, the Sunday after we’re uploading this episode? Well, meet Coaches Hal Mumme and Mike Leach, whose innovations transformed the aerial attack from an intermittent feature of football games, to its primary focus. 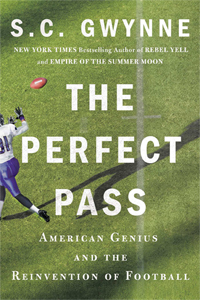 Our guest is New York Times best-selling author and Pulitzer Prize finalist S.C. Gwynne, author of, The Perfect Pass: American Genius and the Reinvention of Football . You may have caught his previous book, Rebel Yell: The Violence, Passion, and Redemption of Stonewall Jackson , or read Empire of the Summer Moon , which recounts the rise and fall of the Comanche. You can find him online at SCGwynne.com, or by following @SCGwynne on Twitter.